After fully gorging myself from a holiday weekend, I decided to continue this path of destruction by going out to dinner with two friends. I had just seen American Reunion (it’s what you would expect), and we decided to keep the momentum going by walking to a place nearby for an early dinner. Only two of us went to the movies, so the other one met us at the restaurant. In the interim we decided to grab a drink. While drinking, we decided it would be a great idea to get another drink at dinner. What planning! We’re idiots and decided to eat “light” by going to Boqueria for tapas (light, I’m sure). We were trying to keep kosher for Passover, so NO bread! How bad could we possibly eat? The two of us walk into the restaurant, and it’s pretty empty. I would say it’s a surprise, but most people don’t eat dinner at 6pm on a Sunday (or ever). The hostess then seats us at a communal table. There are 3 of us, and no one is in the restaurant. Lets seat us at our own table. I know you don’t know us, but you don’t want us near the other guests. It’s tapas so the menu isn’t that extensive, but we are really diving in. “I want the patatas bravas. If you guys don’t want them, I still have to have them.” Wow, easy killer. Who said we couldn’t get them (they fit the Passover bill)? I picture her with this plate in front of her never coming up for air. “I love those. Definitely!” I say. Then little Miss Spinach goes, “There are four things, we definitely need to get. The rest I don’t care.” FOUR THINGS?? Most people put in a two dish request, she puts in for four, and they’re all mandatory. They were: the spinach, the hanger steak, the shrimp, and the lamb meatballs. I wasn’t opposed to any of this, so those were put on our definite lists. I threw out the bacon wrapped dates. Bacon is kosher for Passover! 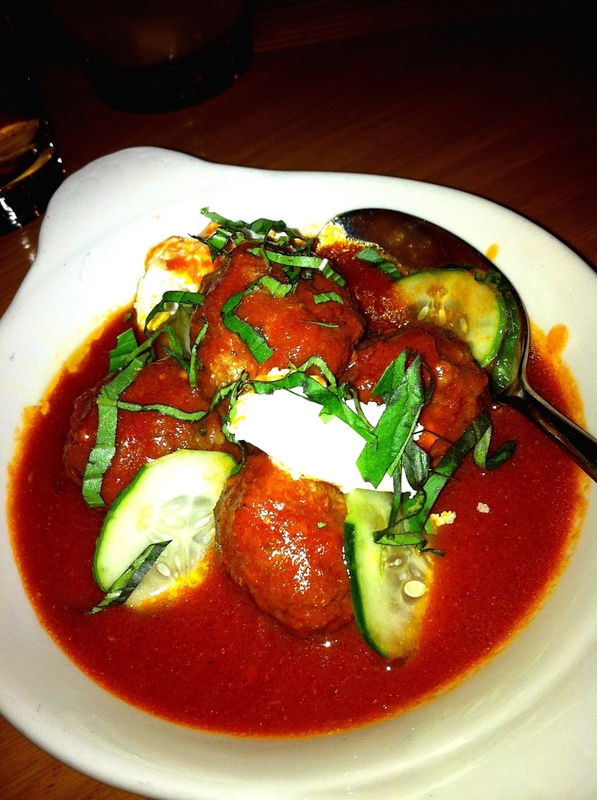 Miss Patatas Bravas overlapped with Miss Spinach on the meatballs on her top 5 list, so we were good to go. 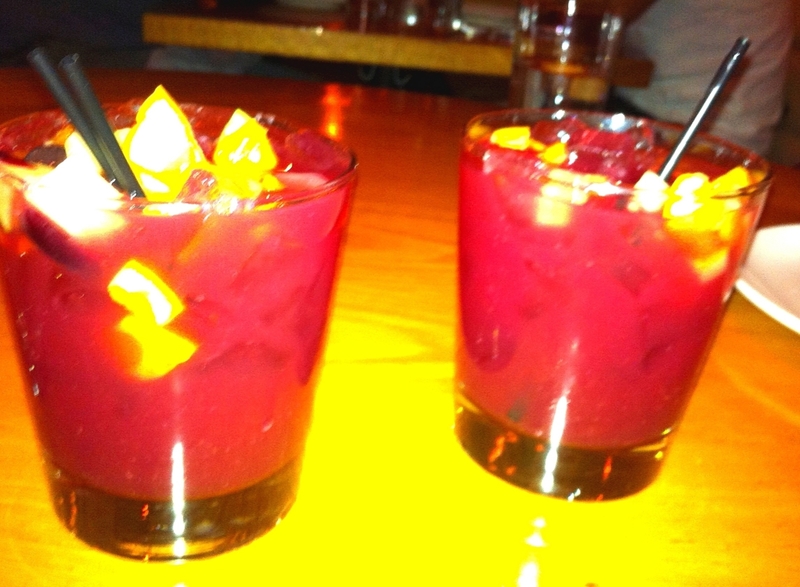 Sangria! Ay ay ay ay! This poor waitress. She was on the quiet side, and we’re just not on the quiet side. She shockingly comes back with, “I would get one more if I were you.” Ok, wow! We decide we can just order another dish as we move along, to see how hungry we are. We all dive into to each dish as they are served somewhat staggered. Stuffed dates first, amazing, but there are only three. Biotch please. 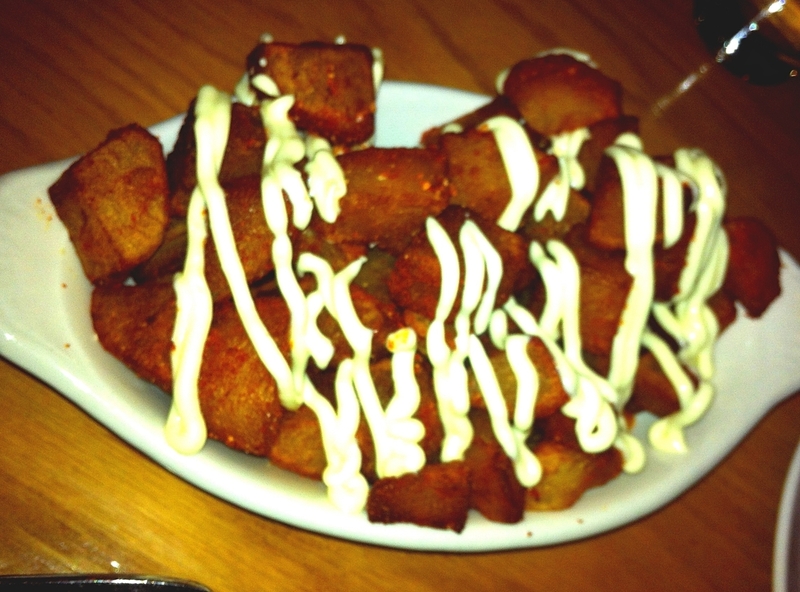 I continue attacking the patatas bravas. Then comes meatballs and hanger steak. Both great! Check magically appears and we realize we never ordered a sixth dish. UH OH. Great! Picked some of the fruit out and nibbled on it…in public. 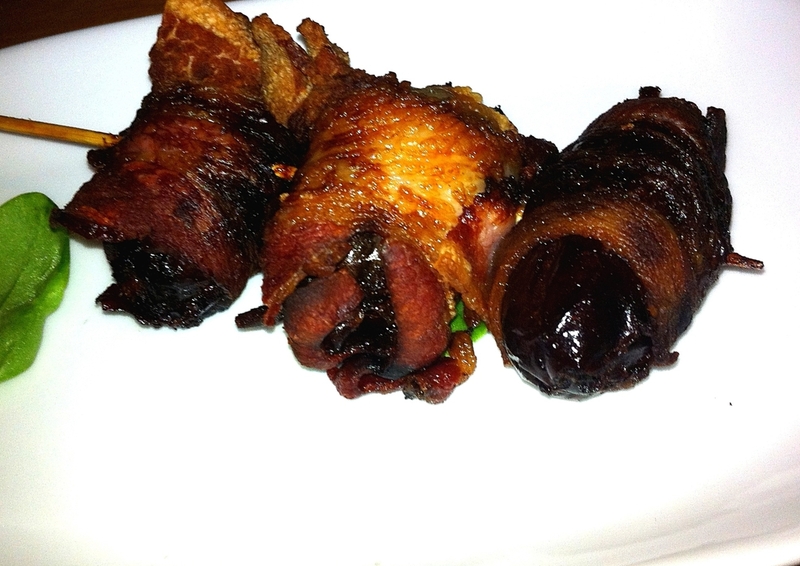 Dates stuffed with almonds and Valdeon, wrapped in bacon. It was a blessing and a curse that there were only 3 of these. I could have eaten ten more! 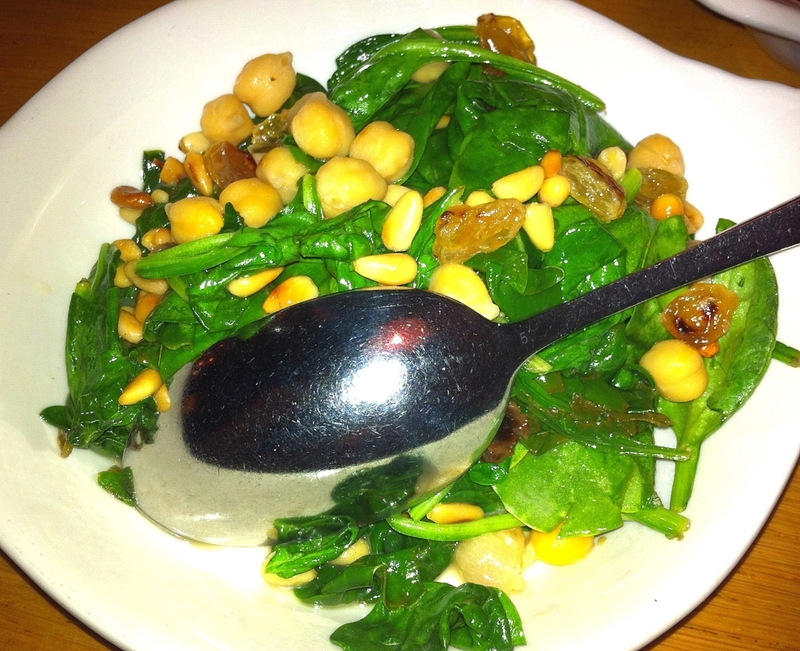 Sauteed spinach, garbanzos, pine nuts, garlic, raisins. Just because it’s green doesn’t mean it’s great for you. Smothered in oil, it was yummy and sweet, but who cares? I kept Passover. Crispy potatoes with a garlic sauce on top and a red sauce at the bottom to shmush (that is a big girl word) the potatoes in at the bottom? It’s never a bad idea. 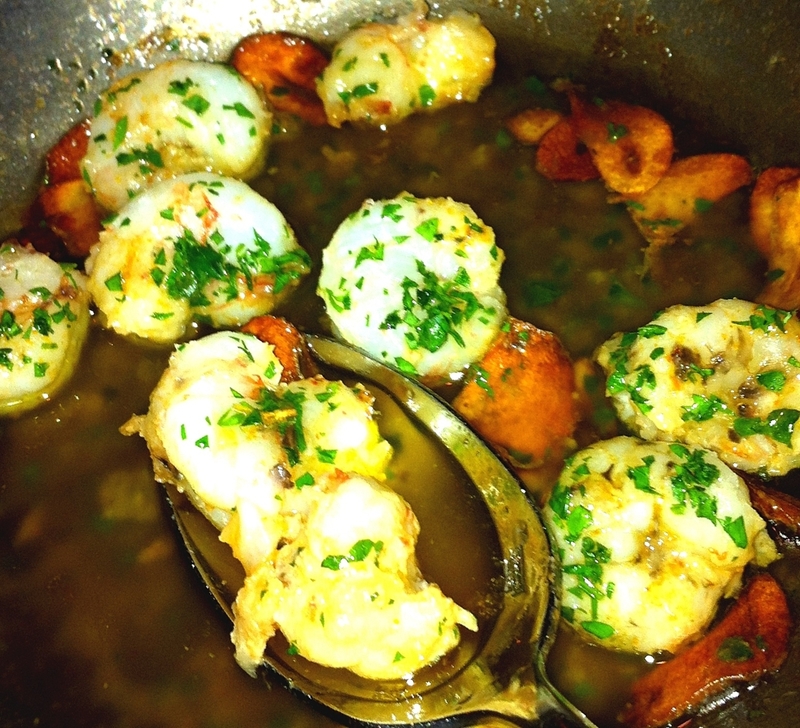 Shrimp, garlic and Guindilla pepper in olive oil. It tasted like it was doused in butter and oil. Not to say that is bad, but don’t think you’re being healthy by ordering shrimp. Lies! All lies! Lamb meatballs, tomato sauce, sheep’s milk cheese. I don’t know if I’m one to judge what is deemed light, and what is deemed heavy, but I’d venture to say that for meatballs, it tasted light, and didn’t make you feel weighed down afterwards.